Percy Lee Geiger, The Geigers of South Carolina, 1945, ReprintA Press, Brent Holcomb. Guy F. Spearman (1924-1989) of Atlanta, GA, research, 1977, Guy F. Spearman, Atlanta, GA, to Lew Griffin, 1977. 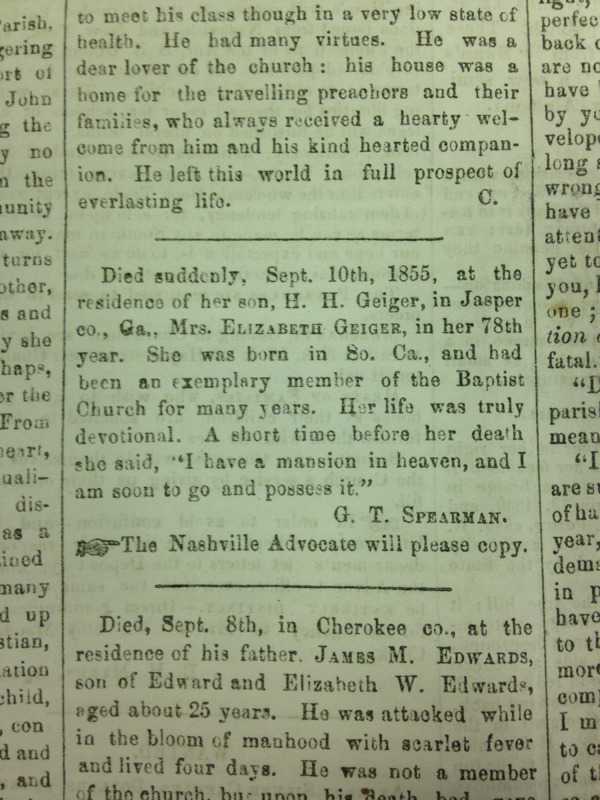 Obituary* 11 Oct 1855� Died suddenly, Sept. 10th, 1855, at the residence of her son, H. H. Geiger, in Jasper co., Ga., Mrs. Elizabeth Geiger, in her 78th year. She was born in So. Ca., and had been an exemplary member of the Baptist Church for many years. Her life was truly devotional. A short time before her death she said, "I have a mission in heaven, and I am soon to go and possess it." 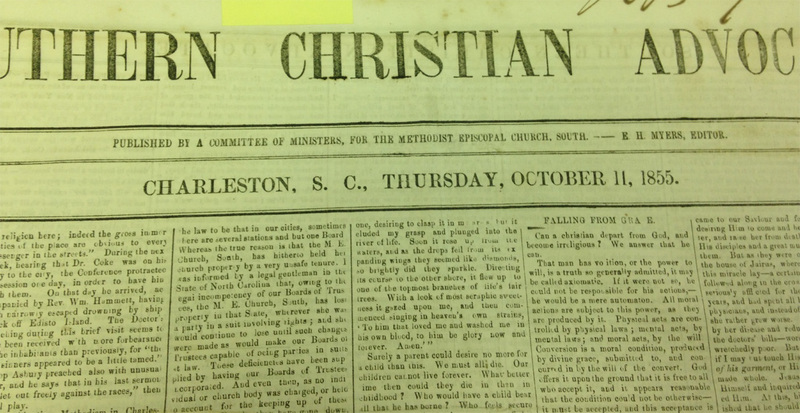 The Southern Christian Advocate, Thursday, October 11, 1855. The Geigers of SC, by Percy L. Geiger, incorrectly names Herman's wife as Lavinia Kaigler. 1790 Census* 2 Aug 1790� He was enumerated in the US Census of 1790 on 2 Aug 1790 at Orangeburg District, South Carolina. The four known children of John Murff were John, Margaret, Frederick and Elizabeth. John Jr. "may have" been a child of Susannah, but no evidence suggests that. The others were children of second wife Elizabeth. The SC Accounts Audited and Stub Indent records (and all other Rev War sources) list a single John Murff with Revoluationary service. He was a member of the Orangeburgh/Amelia TWP branch of the Morf family, lived in Fairfield Co SC with wife Sophia Kinsler from their marriage in 1789. A descendant of his son Samuel (a Methodist minister) was admitted to DAR on John's service, Application #395859. Saxegotha-John lived near Savannah Hunt Creek of the Congarees, in a region that was predominantly Loyalist. He was not listed in the extant muster rolls of either side. He died before the 1790 census, when widow Elizabeth was enumerated with the two sons (John and Frederick) and two daughters (Margaret and Elizabeth) of John Murff. Her son John Tyler (byRudolf Theiler) lived next door. The 3 males aged 16+ in his household may have included his brothers Jacob and Herman Theiler/Tyler. I think that the best one can do re a death date for John Murff (b. 24 Jan 1734) is "reportedly killed at the Battle of Cowpens, per undocumented DAR application #50513" I don't know where the reference to Elizabeth's surname as Kaigler/Keigler may have originated, as used on the DAR application, but Kaigler was definitely not it! Andrew Keigler and his wife Anna Margaretha Leitner arrived in SC with no children in 1752. Elizabeth MNU was married to Rudolph Theiler by 1758. QED: she wasn't a Kaigler daughter--some colonial women may have married fairly early, but not prior to age 6. E-mail written Aug 2004 -- Apr 2011 to Lew Griffin from Harriet Imrey, Chicago, IL, e-mail address. Clara A. Langley, South Carolina Deed Abstracts 1719 - 1772 Vol. III, 1755-1768, 1983, Reprint, Greenville, SC: Southern Historical Press, 2001.
has Elizabeth's surname as Keigler. See the research note from Harriet Imrey elsewhere on this page. Number of Household Members: 5. Will* 20 Oct 1751� He made a will at Charleston, South Carolina, on 20 Oct 1751. I give Devide and Bequeath unto my Eldest Son John Conrad all that the aforesaid Plantation Containing three hundred Acres of Land with all building and improvements thereonto holed to my said son John Conrad his heirs and assigns forever. and I hereby nominate and appoint my said Wife Elizabeth Exrix my son John Conrad my Brother in Law John Gorrman [Gallman] Mr. Benjamin Smith Mr. Henry Lawrence Exors o this my Last will and Testament herein Revoking all former and other wills and wills by me at any time heretofore made Declaring this only to be my Last will and Testament In Witness whereof I have hereunto set my hand and Seal the 20th day of October in the year of our Lord 1751. Pronounced and Declared by the said Herman Geiger for and as his Last will and Testament in the presence of us who at his Request and in his presence have Subscribed our names hereto. Biography* 16 Jan 2019� Herman was christened 18 Dec 1707, in Diepoldsau, Rheinthal, Switzerland. Herman and his family left Switzerland in September 1736, and arrived in Charleston, SC, on February 1, 1737. Herman Geiger became a trader with the Catawba Indians. Herman Geiger's will was proved September 6, 1751. In the SC Gazette of June 18, 1753, John and Henry Gallman advertized for the creditors of Herman Geiger, dec'd. John Gallman was one of the executors of Herman Geiger's estate. John Gallman, who had apparently married one of Herman's sisters, married second Herman Geiger's widow, Elizabeth, and took her children into his home. Both of the above can be found at www.familysearch.org in the catalog. 'About 1750, he rescued several friendly Indians from a band of hostile Canadian Indians who had captured them near Charleston, SC. The following summer, Herman, having set out for the Catawba Nation in company with a half-breed, was captured by several of the very party of Canadian Indians from whom he had rescued the friendly Indians a year before. They carried Herman Geiger toward the Great Lakes and finally killed him. " "Some sources--both online and in print--are still repeating the story that Indian agent Herman Geiger (1707-51) was kidnapped and killed by a tribe of northern Indians. Since that didn't happen, how did such a story get started? And why is it still around? Robert Meriwether explained it in "Expansion of South Carolina, 1729-1765" (published in 1940). In 1747, Indian agent George Haig of Saxegotha was kidnapped by a raiding party of the Nottaway band of Iroquois from New York. He was exhausted by the time they'd reached PA and refused to keep marching, so they killed him. This was reported in multiple sources: a letter from President Palmer of PA, the journal of Indian agent Conrad Weiser, the SC Council Journal, a letter from Haig's wife Elizabeth begging the government to intervene, and a notice of Haig's death in the SC Gazette on 14 Apr 1748. In 1775, James Adair published "History of the American Indians", in which he related the incident in detail. He used initials rather than names for the people he described, so the murdered trader was one "G.H." In 1859, John Logan included the Adair material in his "History of the Upper Country of South Carolina." In a moment of absent-mindedness (or dyslexia), he reversed the initials from G.H. to H.G., decided that the murdered trader must have been George Haig's successor Herman Geiger. Logan didn't bother to check his sources. In 1898, SC historian A.S. Salley Jr. published "The History of Orangeburg County". He borrowed the story from Logan (on pp. 233-4), but he didn't check his sources either. In fact, he included the real story--the death of trader George Haig--on pp. 231-2 in the same chapter, didn't notice that he'd assigned the same fate to two separate Saxegotha Indian traders at the same time."